Recent years have witnessed a constant rise in the spread of ICT (information and communication technologies) infrastructure and a growing demand for ICT goods. The production of these goods is knowledge intensive and the industry relies extensively on intellectual property (IP) rights. This strong and growing demand for ICT goods, and their IP dependence, makes them an attractive target for counterfeiters. 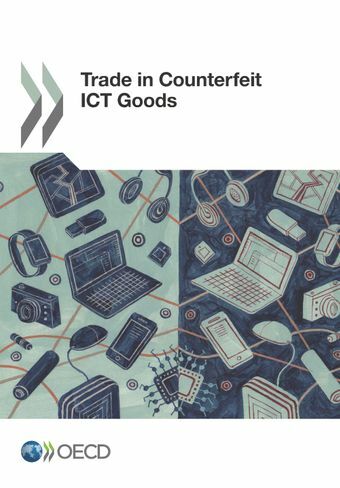 This study looks at the trade in counterfeit ICT goods, including the size of the trade, the main sources of fake goods, and the countries whose companies are most affected. 28/03/2017 - Nearly one in five mobile phones and one in four video game consoles shipped internationally is fake, as a growing trade in counterfeit IT and communications hardware weighs on consumers, manufacturers and public finances, according to a new OECD report. Trade in Counterfeit ICT Goods finds that smartphone batteries, chargers, memory cards, magnetic stripe cards, solid state drives and music players are also increasingly falling prey to counterfeiters. On average, 6.5% of global trade in information and communication technology (ICT) goods is in counterfeit products, according to analysis of 2013 customs data. That is well above the 2.5% of overall traded goods found to be fake in a 2016 report. Launched just ahead of the 2017 OECD Global Anti-Corruption and Integrity Forum on March 30-31, the report says the high value of smartphones and ICT accessories and insatiable demand makes them a lucrative target for counterfeiters, and cautions that the number and range of affected products is growing. Counterfeit ICT goods entail health and safety risks, service outages and loss of income for companies and governments. China is the primary source of fake ICT goods, and US manufacturers are the most hit by lost revenue and erosion of brand value. Almost 43% of seized fake ICT goods infringe the IP rights of US firms, followed by 25% for Finnish firms and 12% for Japanese firms. Counterfeits are goods that infringe trademarks. In an industry that relies heavily on intellectual property rights, ICT counterfeiting preys on consumers’ trust in established brands and poses risks to their health, safety and privacy. Counterfeit phones can contain more hazardous substances like lead and cadmium than genuine ones, while fake phone chargers can mean fire and electric shock risks. Fake intermediary ICT devices and components, including transistors, printed circuits and radio masts, are also being shipped. The report estimates the value of global trade in counterfeit ICT goods at USD 143 billion as of 2013, based on data from nearly half a million customs seizures around the world over 2011-13. Almost two-thirds of counterfeit ICT goods are shipped by express and postal services, significantly complicating the screening and detection process. The ICT sector accounted for 5.5% of total value added in the OECD area in 2013, equivalent to about USD 2.4 trillion. World exports of manufactured ICT goods grew 6% per year from 2001 to 2013 to USD 1.6 trillion, with China exporting almost a third of the total.